The Carrick Swans, formerly known as Greenside Rovers, was founded in 1929, initially as a Junior team. Our first title in 1932 elevated us to Senior level and it took us just a further year to capture our first Senior title in 1933, thus, the scene was set for a proud tradition in Senior ranks which has at 22 victories seen us win more South Senior titles than any other club. Titles were added in 1935, 1936 and 1939 before before a lull for the next 5 years, including a disastrous year in 1942 when we were unable to field a team. Little did we know the golden period that was ahead of us and our great club. We won the South Senior title again with an unequalled 5-in-a-row: 1944, ’45, ’46, ’47 and 1948 while in 1947 we took home the Dan Breen Cup for the first and only time (to date). It was a proud day for all Swan supporters and players especially captain Willie Wall as the trophy was lifted high and we were County Champions. Further South Championships were won in 1950, 1952, 1958 and 1959. We were successful for most of the 60’s and although reaching 4 intermediate finals, amazingly, we lost all 4. Great work was done to promote the game during this “valley” period in our history and with the 70’s a new era dawned for the mighty Swans. An Under 21 county final victory in 1972 elevated us back to Senior ranks, where in 1973 we lost against our old rivals Davins…but will anyone ever forget the scenes at the final whistle in 1974 when revenge was earned on a wet day in the Davin Park which made our victory all the sweeter. More titles were added to our collection in 1978 and another 4-in-a-row 1983, ’84, ’85 & 1986. 1990 brought victory number 20 to the Swan but number 21 proved elusive for what was like a lifetime of 10 years until 2000 when the holy grail of victory was tasted again with victory number 21 in a pulsating match with Ballingarry which saw us claim victory by one point & captain Kieran McGuire lift the cup in Clonmel. We had to wait a further ten years, and see the South championship dominated by the trio of Mullinahone, Killenaule and Ballingarry during the decade, for the South Cup to come to Carrick once more. In that time our Minor Hurlers won the County title in 2004, – beating Drom & Inch and our Senior hurlers won the inaugural Seamus Ó’Riain SH title in 2008 – beating Kilruane McDonaghs. 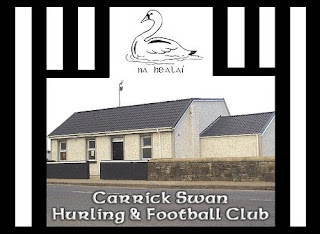 In August 2010 Carrick Swan were victorious over Killenaule in Fethard by a scoreline of 1-16 to 2-11 to win the SHC South title for the record 22nd time. “The Birds” had again been victors of our division and the sense of relief at the final whistle was there for all to witness. The Green as we all affectionately know it holds a special place in the hearts of all Carrick Swans people. Nearly every child has pucked or kicked a ball there and indeed All-Ireland Medal winners first played on the Green. With its position adjacent to what is now our two clubhouses, it makes it so much easier to promote our national games. During the Summer months, our Cygnets play hurling and the “clash of the ash” and enthusiastic shouts can be heard in many of the neighbouring homes. It is a piece of Carrick & Swans history which will be handed down for generations to come.